A good friend of mine, who happens to have the most impeccable taste, just returned from a month-long stay in Paris (can you imagine?!). She emailed me to report that all the chic French girls are wearing loafers, from the classic tasseled Belgian variety to old-school Bass Weejuns. Model/blogger Hanelli Mustaparta, above, was recently photographed in Paris, wearing a tasseled pair by Burberry (last season). I'm thinking they're a fresh alternative to the ballet flat--and just as year-round versatile. Here are a few to mull over from Lanvin (the pair my friend is eyeing), Alexander Wang, Bass Weejuns (more feminine than you'd expect), Boutique 9, Tommy Hilfiger, and Kelsi Dagger. I'm loving loafers! I have an adorable vintage pair in excellent condion. I've had my eye on these loafers since Emma Chadwick wore a white pair with a grey jersey dress in a Backyard Bill feature. These days I like them best when they are a bit chunkier, like they could belong to your grandpa but in 1988 I preferred the beat up, brown penny loafers (I even put old pennies in mine). I think fashion is having a late 80's moment right now. loafers are the best! 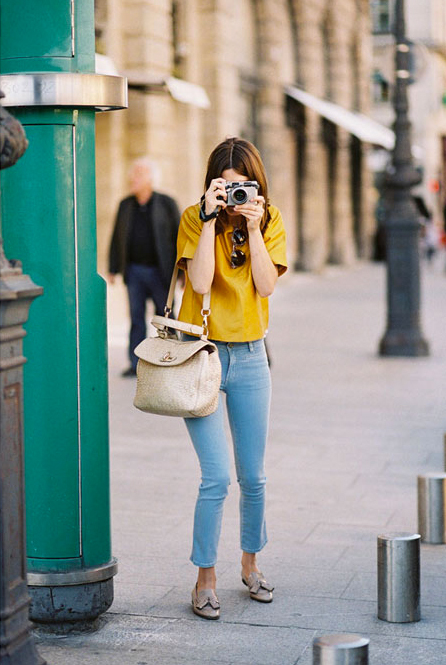 this image is great, the girl's outfit is really adorable, i love the mustard colored top and ankle jeans. Love the Kelsi Dagger option - and they're crazy affordable.